Searching for ways to help boost your baby's language development? Read this quarterly guide on language development in infancy, plus tips on how to jump-start your baby's language skills! The acquisition of language is both a natural and learning process for children. This happens as they interact with people and things in their environment. The process is gradual and comes at different paces for every child. The way you interact with your child will determine how he develops his language skills. The first five years of your child’s life is the most crucial as this is when the foundations for language development are built. Language is divided into two major aspects – receptive language and expressive language. The former is the ability to listen and understand language while expressive language defined the ability to speak and convey messages. 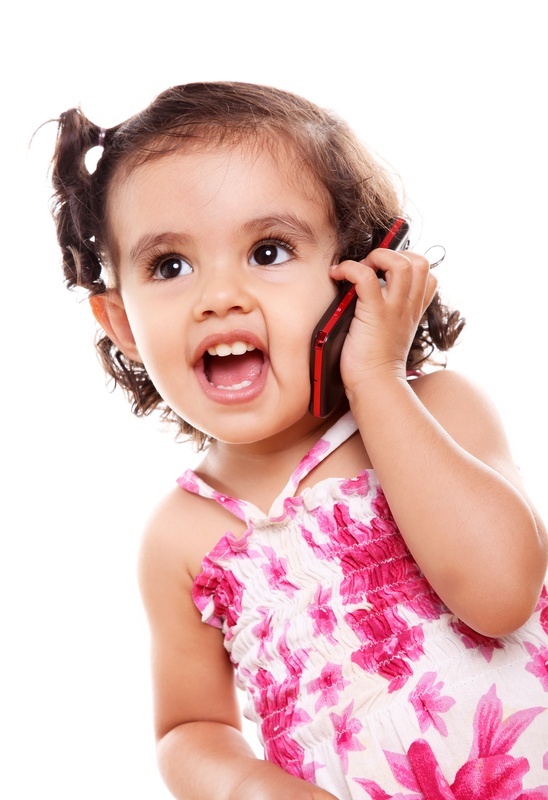 Your child should develop well in both these aspects so he or she can be a good communicator. Babies are aware of sounds in their environment. They cry if it’s very noisy as they are still unfamiliar with most of the sounds they hear. To express their feelings, they make sounds. It is the infant’s way of communicating. Babies start to respond to familiar voices and will listen closely to anything that they are not familiar with. To express delight at seeing their parents or anyone familiar, they usually smile or make a ‘goo-goo’ sound. It is possible to differentiate their cries at this age. They start to respond to the word “no” and seem to be fascinated at other sounds such as music, the ‘whirr’ of electrical appliances and animal sounds. At this point, a baby should be able to open their throat and make gurgling sounds. They are most likely able to sound out consonants such as m, b and p.
At this age, babies are already familiar with their names and will look at anyone who calls them. They will start responding to questions and requests. They will also be familiar with names of common household objects and can point at them when asked. This is the time when babies are most likely to say their first word as they are now able to combine vowel and consonant sounds. Every child is unique and develops at his own pace. Try not to compare your child with other children as this can only cause you undue stress and unnecessary pressure for your child. Some of you may already be panicking after reading on the various stages of language development. The milestones enumerated above are just general ideas and should not be interpreted too rigidly. Remember some children can stay in one stage longer than others while some may go through each stage very quickly. Click “Next page” for tips on how to jump-start language development in infancy! Communicating with your child even when you’re away at work can still help build her language development. Instead of stressing yourself out, take a look at the following suggestions to help jump-start your baby’s language development. As a parent, it is definitely exciting, yet challenging for you to help develop your baby’s language development. Your role is very important as you are your baby’s constant companion. You don’t have to wait for those “special moments” to start helping your baby to develop language. Each moment that you spend with him or her is a ‘teaching moment’. When your baby “coos,” say something in return. This will help your baby get the idea that the sounds that come out of his or her mouth can catch mummy’s or daddy’s attention. Studies show that children who were responded to when they made sounds as babies had better cognitive skills when they were older than those who were just ignored. However, experts say that parents should not respond to every babble as their babies grow older. Mummies and daddies should only respond to sounds that are comprehensible. This will help the little ones to determine which sounds are effective–making them work harder at repeating them. You should find enjoyment in interacting with your baby. According to some studies, babies that are exposed to television, learn six words less than their non-TV-viewing counterparts. Parents are advised not to let their babies watch any television at all. As you do things for him, pretend like you’re talking to an adult and explain what you’re doing in detail. You can also read stories or rhymes. Try to make communicating something really fun for your baby. You may think that baby talk is silly but experts say that this way of talking is actually beneficial for babies. Stretching out the sounds of each syllable actually helps babies become sensitive to individual letter sounds. This makes their auditory facilities more discerning. So start using that sing-song intonation when talking to your baby. Babies also need to see your lips when you’re talking to them. Before they can understand any word that you’re saying, they first need to learn how to segment. That means they have to see when one word ends and another one begins. Hence, let babies watch educational videos. Usually, in these videos, the person who is talking cannot be seen on screen. What happens is that the audio is not complemented by a related image which makes things really confusing for babies. Object labeling is an important practice which parents can use to help their child’s language development. Parents can point to an object while saying, “This is ______.” But this should be done normally with parents just following the lead of their babies. Make sure that your timing is correct so your baby can associate the right label to an object. While doing object labelling, you can use exaggerated motions to attract your baby’s attention. This practice makes the experience not just auditory but visual as well. It’s definitely tempting to keep your baby to yourself but experts say that babies learn words easily if spoken by a variety of speakers. Researchers discovered that a baby will have a hard time learning a new word if only one person is saying it. Even if this certain person keeps on repeating the word, babies will still not get it. But learning a new word will become easy for babies if it’s spoken by many people. Language development in babies is an exciting and educational journey for all children. If you’re a parent watching your infant grow day by day and enjoying the process tremendously, you will find this article beneficial as it is a good guide to aid with monitoring your child’s progress. Source: *Stages of Language Development – Bowen, C. (1998). Ages and Stages: Developmental milestones for receptive and expressive language development. Retrieved from www.speech-language-therapy.com/devel2.htm on 4-12-09. Your child can be the next Kautilya Pandit. Here's how!